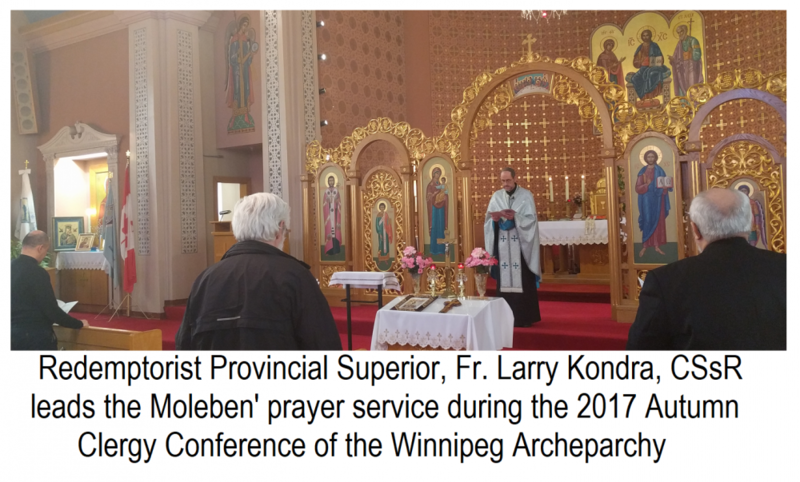 The 2017 Fall Clergy Conference of the clergy of the Archeparchy of Winnipeg gathered on October 12 at St. Andrew’s Ukrainian Catholic Parish church on Euclid Avenue in Winnipeg’s Point Douglas. Some came earlier to enjoy a coffee and fellowship, but the conference got underway at 9:30 am with Metropolitan Lawrence leading prayer from the Chasoslov – Divine Office. A few brief presentations were made of new publications. Natalia Radawetz, curator of the Archeparchy’s St. Volodymyr Museum, situated within the chancery offices building at 233 Scotia Street in Winnipeg, presented her own work – a learning guide for young students – “Our First Bishop”. 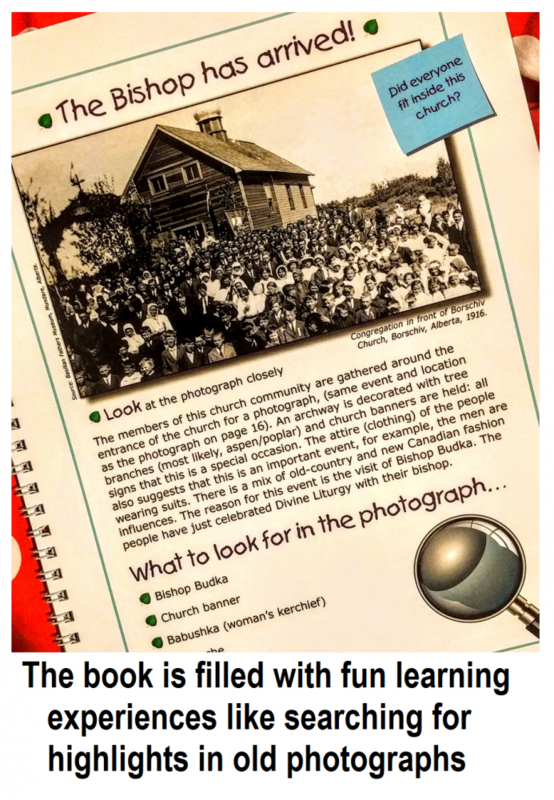 It is a colourful, informational and fun introduction to the life of the first Bishop to Canada - the saintly Bishop Nykyta Budka - who later returned to Ukraine only to give his life for his Faith under the Communist Soviet regime. He was declared ‘Blessed’ by Pope St. John Paul II in Lviv, Ukraine in 2001. Basilian monk, Fr. Zachary Shwaluk from St. Nicholas Parish in Winnipeg, informed the clergy about some of the most recent items issued by OSBM Publications. This included a new edition of the altar service book – Sluzhebnyk – that now contains additional information helpful to the priest at the celebration of the Divine Liturgy. Also available are the new 2018 wall calendars that parishes traditionally order for their congregations prior to the new year. After various other notices and informational presentations, Metropolitan Lawrence gave two brief presentations on his participation in the all-Church Synod of Bishops of the Ukrainian Catholic that was held in Brukhovychi-Lviv, Ukraine in early September and his participation in the Plenary Session of the Canadian Conference of Catholic Bishops in Cornwall-Ottawa, Ontario. 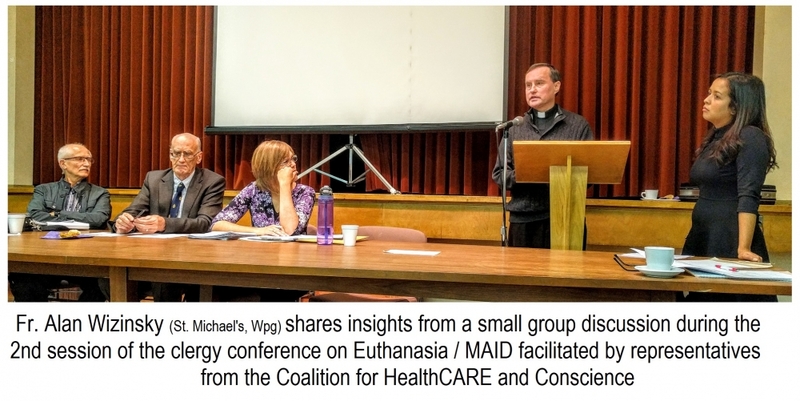 The main theme on the agenda, however, was the whole matter of euthanasia – aka Medical Assistance in Dying (MAiD) – aka assisted suicide. Particularly tied to this question was the right of persons serving in the medical profession to follow their conscience – regardless of religious or political persuasion – and not participate in any way that would violate their conscience. This might seem like a “no brainer” to any person in the “free world”. However, there have already been shocking presidents where there is an attempt to force persons serving in health care and health-care institutions to participate in the killing of patients via assisted suicide. Some try to propose what they see as a compromise – the doctor does not have to perform the procedure, but has to then refer the patient to someone who will. This too is obviously a violation of conscience. “I don’t believe in killing patients, but I will send you to someone who will”. As one individual on the panel suggested, it’s like a mafia figure saying that he had nothing to do with the assassination, it was the hitman that he sent who pulled the trigger. The discussion on the whole was very much appreciated by the clergy who did not hesitate to ask tough questions to clarify any point. The conference involved presentations, witness accounts, small group discussions and sharing and an excellent Q & A. Everyone agreed that they gained much information – especially facts and figures on what has been happening in Canada since the supreme court mandated legislation on assisted suicide about a year ago. 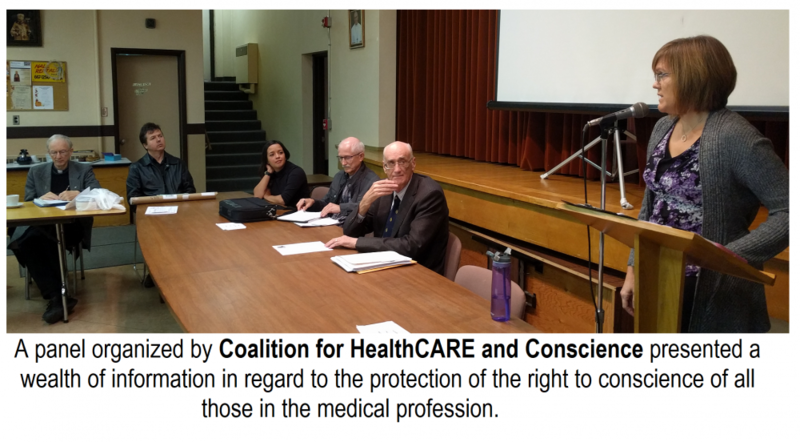 The panel, put together by Manitoba representatives of the Coalition for HealthCare and Conscience, consisted of: Dori Friesen, Dr. Frank Ewert, Dr. Don Peter and Kathy Boschmann. The panel was able to stay for lunch, so the conversation continued later in the program. After the second session and the Q&A was over, the clergy made their way up to the beautiful St. Andrew’s Church. 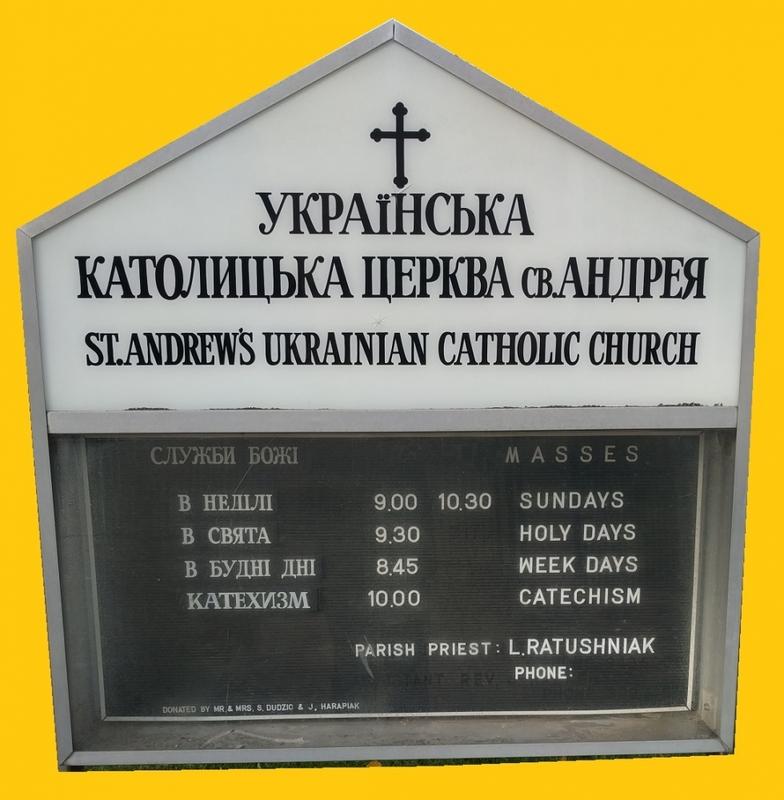 The traditional byzantine frescoes and iconostas make St. Andrews one of the hidden jewels of the Ukrainian Catholic Church in Manitoba. The Provincial (i.e. Canada-wide) superior of the Redemptorist Fathers, Fr. Larry Kondra, C.Ss.R. led the Moleben’ to the Mother of God, with Fr. John Sianchuk, C.Ss.R. leading the clergy in the responses. A special privilege awaited the group. 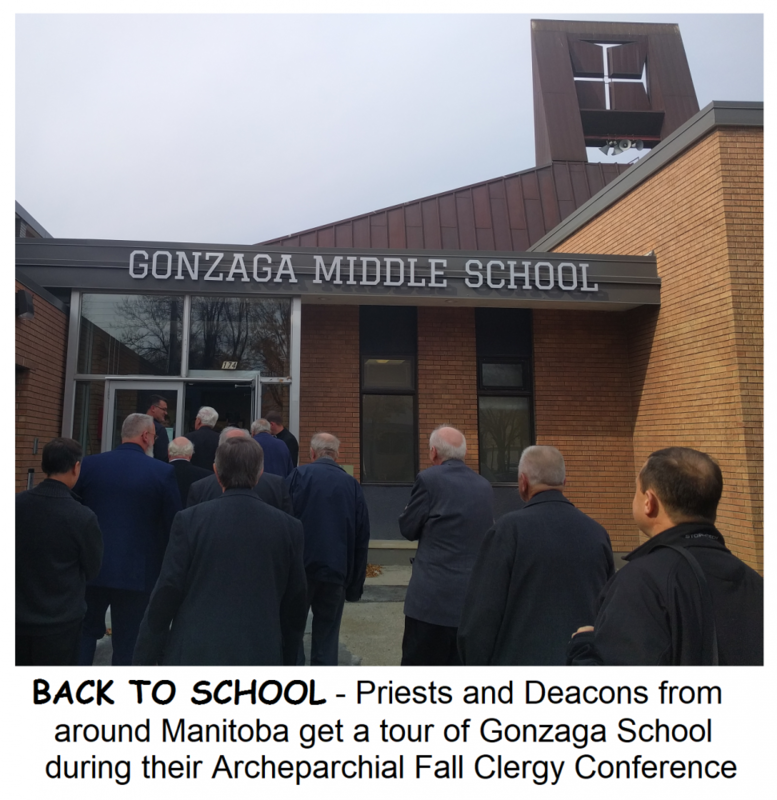 A tour of the relatively new Jesuit-run Gonzaga Middle School was arranged by St. Andrew’s parish priest, Fr. Len Ratushniak, C.Ss.R. 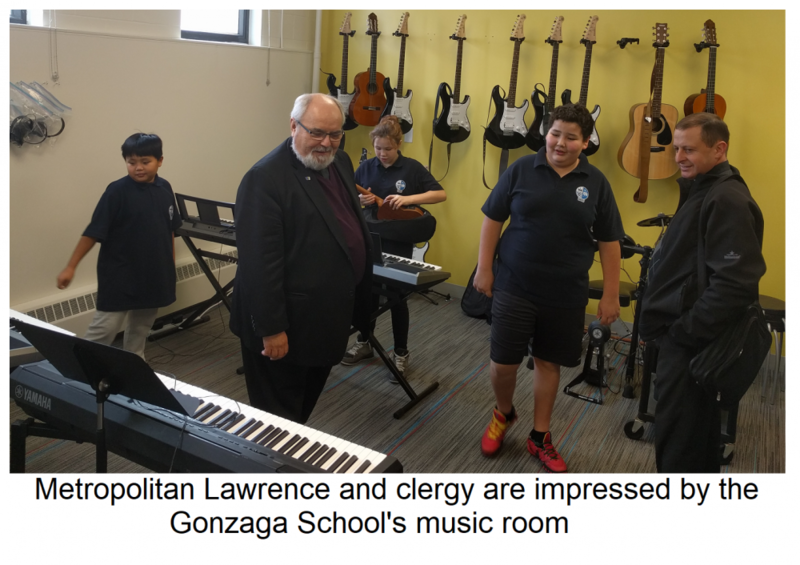 The clergy were met by school director and principal, Mr. Tom Lussier and a large number of students and staff. 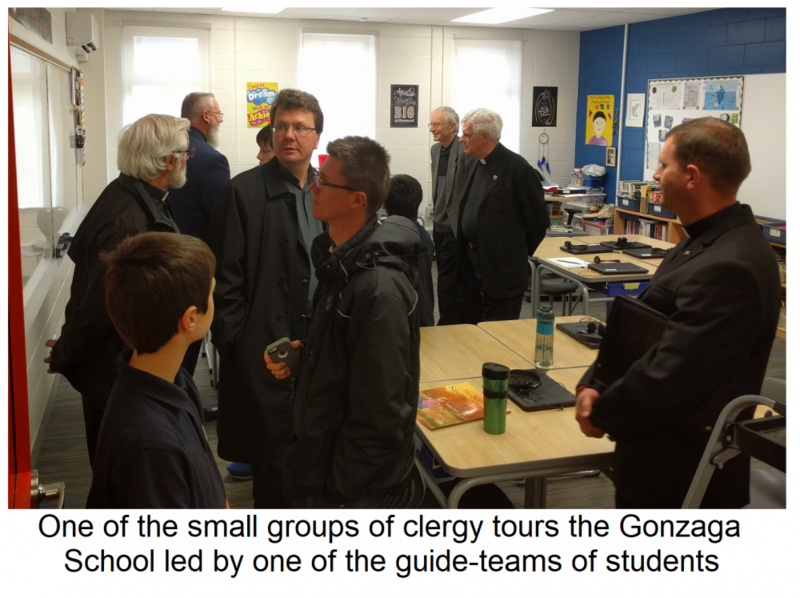 After a brief introduction, teams of three-students each, led the clergy - in groups of about five – on a tour of the school. It was truly impressive. The students were quite profession and upbeat. They gave a concise but excellent spiel at every stop along the way. They showed their classes, the truly impressive music room and library. The full-sized gym, kitchen and lunch area were immaculate and wherever the Fathers were taken, they encountered bright and confident youth. After the rather serious discussions earlier in the day, the bright and hopeful atmosphere of Gonzaga was truly inspiring. After the tour, the clergy returned to the church auditorium where the ladies of St. Andrew’s Parish had prepared a fantastic lunch of soul-warming borsch, a vast variety of sandwiches and an abundance of fruits, fresh vegetables and, alas, irresistible desserts. It was an excellent conference. Kolpaks off to Fr. Len and the parishioners that set up and facilitated everything needed for the conference. And heartfelt thanks to the team from Canadians for Conscience that provided such insightful and helpful information.